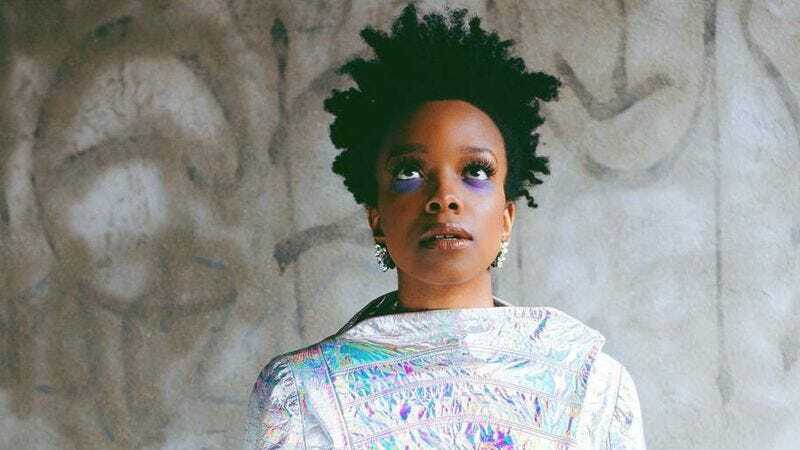 Jamila Woods splashed onto the scene singing hooks for rappers like Chance The Rapper and Macklemore, but her debut album, HEAVN, finally lets her take center stage. The Chicago singer, poet, and activist presents a complex, honest picture of black womanhood on HEAVN, bridging everything from splitting a meal from Harold’s Chicken to her love of Incubus while perfectly capturing the city’s soul and spoken word. Fresh off being named one of Chicago Magazine’s “19 Young Artists You Need to Know About,” Woods sat down with The A.V. Club to describe the inspiration behind the album and three of its songs that showcase her ability to bind the political and personal. HEAVN is available for streaming on Soundcloud and features guest appearances by Chance The Rapper and Noname, and production credits from Kweku Collins, Peter Cottontale, and Saba. Jamila Woods: I think that came out when I was doing the first draft. I was like, “Oh, this is cool, if I try to rewrite ‘Miss Susie,’” which was one of my favorite games. In my family, we never cursed. It was very bad to say bad words, so I sort of liked that game for that reason and learning what bad words were. There was really no one above me to learn those things from. So I loved that, and I think it really sticks with the time in which these things were going on, and is also another example of things people aren’t trying to say. A lot of people of color and the Black Lives Matter movement will talk about what’s really happening, but it seems like you can’t get the black president to say something that’s obvious about what’s happening to black people in this country. When you’re in academic spaces, things can start to get a lot more coded, and I just liked the idea of being real and using that form of the clap game and having a contrast of the content of something and how it sounds. It sounds nostalgic and like a childhood game, and it’s the idea that no black children are being allowed to be children and they’re being robbed of their childhood. I felt like that layer of that contrast was important. The A.V. Club: It definitely speaks to the ability of children to speak truth to power. It’s also reminiscent of “Ring Around The Rosie,” and how it’s really about children dying. JW: I love that you brought that up! There was a version of “LSD” where [I] interpreted it like “Ring Around The Rosie.” I’m glad it got cut because I got Chance’s verse, but I like that. JW: Hairdressers are all-knowing. They’re so wise. AVC: So you performed that for Brown Girls, Samantha Bailey’s webseries that’ll be out in February [Samantha Bailey is a Chicago-based director, actress, and writer who created and starred in the webseries You’re So Talented—Ed.]. How did you decide on that song? JW: She was basically like, “I have to figure out a way to get this song into the series.” I was working on the soundtrack to the whole series, too, and then the day that the show came, she was like, “What song do you want to do?” And I was like, “VRY BLK. I thought that’s what you wanted.” And she said, “Thank goodness. That’s what I wanted, but I wanted to make sure it was okay with you.” In that context––in a party full of beautiful people of color––it was a very celebratory song, too—there’s a celebratory element obviously in the hook. The idea of being able to speak truth to power is also, I think, something to celebrate. AVC: Absolutely. And was it important for you to get Noname on that track? JW: Definitely, yeah. She was who I wanted from the very beginning—her lyricism and the way that she says things… I just think her writing is very beautiful. There’s a way that she is able to talk about very violent things and traumatic things and beautiful things, and it’s all in a way that twists your expectations. She came in and said it was written, and I had listened to it the first couple of times she was running it and was like, “Oh, this is dope.” And five minutes later I was like, “Wait. I just got why I meant that was so dope.” I love the depth of her writing. It was the perfect thing. AVC: I really love this one because of the importance of owning your name, and how black girls aren’t always afforded the luxury of having names that are deemed beautiful. So coming from that background, you tell this story of how you felt like you were naming yourself. JW: Actually, all the voicemails were my friends and some of my students. So that story was my friend Eve, who is also a journalist from Chicago. The song basically came out of me wanting to just write about how people mispronounce my name and spell it wrong and can’t get it right, even people I’ve known for so long. At a certain point, when it’s been years, it’s really hard for me to be like, “Hey, it’s Ja-MEELA and not Ja-MILA.” It came from that place of wanting to assert what my name was. It’s a part of my identity and it took me a while to appreciate my name. That’s how Eve called me, and I think she answered all of the questions. I just really love that story about her name because it also just spoke to black girl magic or black girl divinity. It was given to her mother before she was born and I thought that was so beautiful. JW: That was very inspired by Lake Michigan and also Lake Shore Drive, because coming from Beverly [a South Side Chicago neighborhood] as a kid, whenever we were around the beach or on the lake, it just felt really magical to me. It was something that was always a special occasion where we’d go to South Shore or somewhere downtown, and it was always very special. AVC: It so beautifully captures that love of Chicago and how even though we have our problems, we can criticize it, but you won’t stand for other people coming for your city. JW: And I think it was also a cool thing coming from the South Side. The lake was always my orienting point when my dad was teaching me how to not get lost. The lake is east so you’ll always know that. It’s a weird thing where you can kind of feel where you’re at in Chicago, and when I was downtown, I was like, “Oh, it feels more open over here. That must be east.” It felt like a little secret thing. I also liked that the idea that water goes in and out of this song a lot. I was at the beach some time during writing it and looking at how many different people were there and how the water hasn’t been gentrified. The beach is still a public place, and that’s an amazing grace about Chicago. We have so many problems, but the water always stays. That inspires me and keeps me inspired about the city and keeps me hopeful. AVC: What did it mean for you to have Chance on that? Did you reach out to him or did he reach out to you? JW: I reached out to him because of his writings about Chicago specifically. That song “Pusha Man” on Acid Rap, talking about Chicago, that was very inspirational for me because it was very immediate and very honest and a way to talk about… it’s hard when other people are talking about Chicago having not been there. But there has to be a way for people to talk about the issues in our own words. I thought that song was doing that, and I wanted to be a part of it, and I’m glad it worked out.